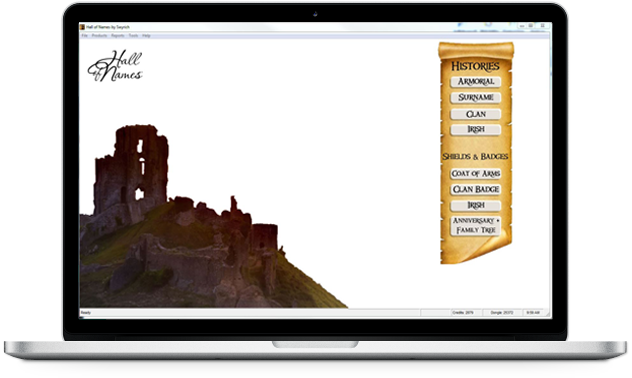 Our web site offering for Family Surname History Products using the Hall of Names engine. Founded in 1988, Hall of Names Family Surname History software is featured in over 300 locations worldwide. Founded in 1968, has designed products for Municipal and Community clients throughout Canada. Kingpins.net + Pinscentral.com, provide custom made and stock emblems from lapel pins to challenge coins. This site provides a wide range of consumer products using our Hall of Names software. By 2015, this site had over 5 million unique visitors per month. Many schools and universities link to our site directly for their student’s family research. This site sells Surname Histories and Coats of Arms in print format, as well as downloadable digital products in PDF or JPG formats. 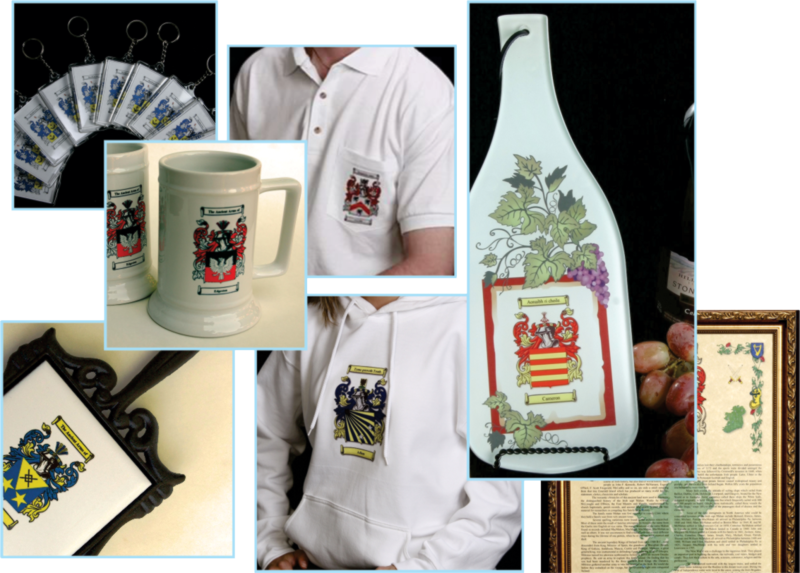 Also available: Golf Shirts, Hoodies and T-shirts; Ball Caps and Tote Bags; Coffee Mugs, Beer Steins and Tiles; all imprinted with a Coat of Arms. Extracts of our surname research are available on-line, with extensive links to our knowledge base. Fast, efficient and pleasure to use. Let's face it, computers are often a challenge. Our support team helps you make our software work by using software like TeamViewer to "remote desktop" into your local computer to fix the issues that arise from time to time. Founded in 1968, this company has designed products for Municipal and Community clients throughout Canada. International Coats of Arms has designed products for Municipal and Community clients throughout Canada. Our design service portfolio includes custom designed Badges, Coins, Medallions, Medals, and thousands of Promotional Items from Key Chains to Temporary Tattoos. 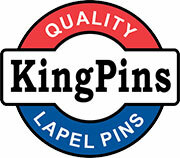 Kingpins.net, Kingpins.ca, Pinscentral.com and Pinscentral.ca provide custom and stock metal products to North America. Servicing the American and European market with custom pins, medallions, coins and challenge coins. Servicing the American and European market with in-stock awareness, flag and theme pins. Servicing the Canadian market with custom pins, medallions, coins and challenge coins. Servicing the Canadian market with in-stock awareness, flag and theme pins. Since BBB's rating inception, the BBB has awarded Swyrich the A+ Rating every year. We are one of the few companies that offer a 100% Satisfaction Guarantee on all our custom and stock products. Accordingly, our quality is second to none and customer satisfaction is proven by our BBB rating. Our return rate for all our companies is less than 2% and considering over 95% of what we sell is custom made, we have a proven innovative quality standard. Through TreeCanada, Swyrich has now planted over 30,000 trees across Canada. Our popular surname and firstname history web site now sports a new cleaner look providing easier reading for all our visitors. Through TreeCanada, Swyrich has now planted over 25,000 trees across Canada through donations of over $100,000. Established in 1968, this year marks our 50th anniversary serving Canadian municipalities and public safety officials. In celebration of this milestone, a new responsive website is launched. Record annual sales achieved by HouseofNames.com, International Coats of Arms and Kingpins. Hall of Names releases three patches over the year. Ivanhoe Service Pack 1 is released – with Window 8.1™ support. Fall: Ivanhoe Final is released – with Window 8™ support. Spring: Ivanhoe RC1 is released – with Vista™ and Windows 7™ support. Hall of Names software now has over 300 world-wide licensees. For the past year, Houseofnames.com has had over 100,000 unique visitors per week. For the second year running, Swyrich Corporation earns a place on the Honour Roll of the Better Business Bureau. To qualify for this honour, the BBB member must be a BBB Accredited Business for at least five years and have no complaints for the previous calendar year. Hall of Names Version 8 is released – an upgrade with a Vista support. Swyrich earns TRUSTe® certification. Hall of Names launches WebStore – a free customizable online Store for all Hall of Names licensees. Swyrich sells over 2.8 million lapel pins for the year! Pinscentral online store was launched to meet the growing need for in-stock lapel pins. The Hall of Names Software Release 4, in April, introduced 400,000 fullcolor Coats of Arms, which could be printed on regular paper as a stand-alone product or in combination with a surname history using an inkjet printer (HP1000c). Kingpins.net was added to the Swyrich family of companies to properly brand our high-quality custom lapel pins in the American market place. Swyrich enters into several partnerships to allow the use of our clipart and surname histories, which is incorporated into CorelDraw® 7 and Corel Family Tree Suite™. Swyrich Corporation is founded by David and Sherry Richardson, who move the business to Kingston, Ontario. As well as hiring researchers to continue the perpetual growth of the surname and coat of arms databases. Realizing the tremendous potential in the software market, they began the challenge of digitizing the Coats of Arms library into clip art that can be used with the new Windows operating system. One of the results of this labourious task is the collection of high quality Coats of Arms now included in the Hall of Names and House of Names product lines. Swyrich buys International Coats of Arms. January: As a result of the phenominal sales, Eaton’s signs Hall of Names for 12 major locations across Canada. March: Hall of Names signs it’s first Canadian licensee. This signing would begin a flurry of licensees including licenses in the UK. Hall of Names Surname Histories were featured from a 40 square foot location at the main Eaton’s store in Toronto for the ten days before Christmas. Sales: $36,000. Hall of Names is founded in Toronto, Canada, researching family surnames. After a very successful appearance at Expo’67, Mr. Tunstall opens a business named International Coats of Arms on Yonge Street in Toronto, Canada. This would become a long-standing company rich in heraldic tradition and design, serving thousands of consumers and municipalites in Canada. Staff artists designed Coats of Arms and logos for countless organizations and companies – many are still in use today. Over the years, we have donated to charities in Kingston, Ontario, and to various sporting groups throughout Canada. Effective February 1, 2013, a percentage of each sale plants trees in throughout Canada. We allocate trees to regions based on the percentage of sales from those regions. Swyrich, working with TreeCanada, helps plant many species of trees that are native to the various regions of Canada, as well as replacing trees that have been damaged by disease. TreeCanada Greening Canada's School Grounds Program has contributed to the greening of over 539 schools. To apply to this school program, visit their Application Form page. Our first planting took take place in 2014. By March 2017, we had planted over 20,000 trees. By March 2018, we had broken the 25,000 mark with donations of over $100,000. For many years Swyrich has had a personal invesment in the Cantabile Choirs of Kingston with members of the family partaking in the many concerts. Swyrich donates online ticketing and chorister registration services and our principles both volunteer at the concerts. In 2015 and 2016 we have supported local communities by either donations or support programs for Pride Parades from British Columbia to Newfoundland. In 2012 Swyrich received the “Outstanding or Innovative Sponsorship” National Award from the Association of Canadian Choral Communities. With two of our staff playing for a team in Kingston Hockey League Swyrich was quick to offer their support for the team. Scotties Curling BC 2012 – Provincial championship held at North Shore Winter Club hosted by 2012 BC Scotties, a community event trying to make a difference. Through the Cataraqui Golf and Country Club, we have sponsored a Golf Hole, in their annual Golf Tournament, the proceeds of which go towards the Cancer Centre of Southeastern Ontario, including helping to build a new Chemotherapy Suite. A proud Canadian company serving the world market. Every service and product that we provide is backed by a 100% Satisfaction Guarantee. Considering 95% of our products are custom made, quality of product and service is essential. Hall of Names and La Maison de Noms are registered trademarks of Swyrich. This Web Site is provided by Swyrich Corporation, (“Swyrich”), conditional on your acceptance of these Terms and Conditions. By browsing, accessing, using or downloading information from this Web Site, you agree to accept and abide by these Terms and Conditions for each use and each visit to this Web Site. If you do not agree to these Terms and Conditions, you may not use this Web Site. The terms “you”, “your” and “yours” refer to the person accessing this Web Site. The terms “we”, “us” and “our” refer to Swyrich. Swyrich reserves the right, at any time, to modify these Terms and Conditions, and you agree to be bound by such modifications. The modifications shall be effective immediately upon notice to you, which may be given by any means including, but not limited to, posting on this Web Site. Swyrich owns or has rights to all of the wallpaper, icons, coat of arms, surname histories, information, art work, images, data, logos, sounds, graphics, music, text, or other content of, or available from, this Web Site (“Content”), with the exception of client images and 3rdparty and theme content and images used in the creation of this web site. The Content shall not be altered in any manner including the removal of any copyright notice. Content shall not be redistributed, published, cached, broadcast, or copied in any manner whatsoever except as expressly permitted herein. You shall not use manual or automated software, devices, scripts robots, other means or processes to access, “scrape,” “crawl” or “spider”. You shall not use bots or other automated methods to access this Web Site, add or download Content, send or redirect messages, or perform other activities through this Web Site, unless explicitly permitted by Swyrich in writing. You shall not access, via automated or manual means or processes, this Web Site for purposes of monitoring this Web Site’s availability, performance or functionality. You shall not engage in “framing,” “mirroring,” or otherwise simulating the appearance or function of this Web Site. You shall not engage in any action that directly or indirectly interferes with the proper working of or places an unreasonable load on this Web Site’s infrastructure, including, but not limited to, sending unsolicited communications to other users or Swyrich’s personnel, attempting to gain unauthorized access to this Web Site, or transmitting or activating computer viruses through or on this Web Site. You shall not use the Content for any purposes other than the Purpose. The foregoing restrictions apply even if your use of the Content does not constitute a breach of Swyrich’s copyright or other intellectual property rights in the Content. If in Swyrich’s sole opinion you have breached any of these Terms and Conditions, Swyrich may in its sole discretion deny your access to the Web Site either on a temporary or permanent basis. The Content of this Web Site is provided strictly “as is”/”as available” without warranty or condition of any kind, either expressed or implied, including, but not limited to, any implied warranty or condition as to the satisfactory quality (or merchantability), fitness for a particular purpose or non-infringement. The Content is subject to change at anytime by Swyrich in its sole discretion. All Content on this Web Site and all trade-marks, service marks and trade names used on this Web Site are subject to intellectual property rights including copyrights and trade-marks held by or licensed by Swyrich and their respective holders. Except as expressly provided in these Terms and Conditions, no license to use or reproduce the Content is given to you and all intellectual property rights are expressly reserved. These Terms and Conditions shall be deemed to have been made and performed exclusively in Ontario and shall be governed by and construed under the laws of Ontario and the laws of Canada applicable in Ontario without giving effect to its conflict of laws principles. You hereby submit to the exclusive forum, jurisdiction and venue of the courts of Ontario for any claim related to this Web Site and agree not to bring any action, claim, suit or proceeding against Swyrich (including its directors, officers, employees, representative, contractors, affiliates, agents, suppliers, successors or assigns) in any jurisdiction other than Ontario. The Swyrich Corporation family of products include licensed Heraldry Software for Small Businesses; Custom Design Services for Lapel Pins, Coins, and Medallions; and a variety of Stock Lapel Pins for Ribbon Awareness Campaigns, National Flags, and Recognition. We also have Custom Design Services for Lapel Pins, Coins, Medallions, and much more, with a variety of Stock Lapel Pins for Ribbon Awareness Campaigns, National Flags, Recognition and Excellence, and Schools. Over 90% of our products are custom made to EACH customer’s very unique requirements. Product acceptance has been over 99.9%. This is our commitment to getting it right! Total customer satisfaction is our watchword; repeat customers are our lifeblood! Today, Swyrich is a class leader through its internet properties, innovative software and direct sales force. Its reputation is built upon a comprehensive line of products satisfying the world-wide marketplace. Swyrich has an expanding global network of resellers and distributors who support customers in numerous countries. Swyrich provides solutions to thousands of organizations, from Fortune 500 corporations and governments, to municipalities and educational institutions. Swyrich Corporation’s websites are trusted destinations, providing reliable products and services for Hallofnames.com by Swyrich, Houseofnames.com, InternationalCoatsofArms.com, Pinscentral.com, Kingpins.ca and Kingpins.net. Our retail products are available through our secure store web sites, as well as through our many licensees. Innovation and commitment to quality are central to Swyrich Corporation. Swyrich provides in-house historical research, web-page design and maintenance, and software development. The company strives for continual improvement in the ways we do business with our customers, clients, and partners. We are passionate about our company, our research, and most importantly our customers. Over the years, Swyrich work has been incorporated into packages produced by Corel®, Nova™ and IMSI™.